and causal bodies, together with a considerable mass of phenomena, of the various planes to which these bodies belong, it may be useful, to glance over the whole ground we have covered, and draw a few general, conclusions. Turning to the important matter of clairvoyant research, it seems to be a fact just at present, that what we may term objective clairvoyance is comparatively, rare. By objective clairvoyance, we mean that definite and definitive type of higher sight, or apprehension, which objectivises the things which are perceived; which in fact, makes things of them, as objective, in their own degree, as are the ordinary phenomena of the physical plane. There is, however, another type of clear-seeing, which we may term subjective clairvoyance. In this type, there is a form of perception, perhaps more accurately termed apprehension , which does not objectify that which is being observed, but which rather feels or cognises it in a more subtle, and a more interior manner. Let a simple illustration suffice. Whilst relatively few people are able to see auras, so that they can become perfectly objective, far more seem to be able to "sense" auras, and to know without actually seeing, what are their general characteristics, such as size, quality, colour, and so forth. They appear to see, quite literally, with the "mind's eye". In both cases of clear-seeing, the wise and experienced student will be extremely, cautious and prudent, and will always take a strictly conservative view, either of what he sees—or thinks he sees—or of ( Page 329 ) what he feels—or thinks he feels. Whilst it would be highly foolish, and contrary to all the canons of scientific method, to ignore, or discount too severely, that which is seen of apprehended, it is equally as foolish, and certainly more dangerous, to accept rashly, and without careful corroboration, everything that is seen or apprehended. The student must, in entering the unknown, strive to maintain that careful balance, between caution and rashness, which alone leads to true knowledge and keeps him on that "middle path" which has so often been described as narrow as the edge of a razor. As mentioned in a previous volume, to have attempted to give proofs of the statements made in these books would have been, for many reasons, quite impossible, or at least impracticable. For a very large proportion of the contents of these volumes, rigid, intellectual proof could most certainly not be given, because it is not at present available. Comparatively few things - some would say no things—can be proved absolutely: facts, phenomena, observations, statements, are one thing; proof of those facts, etc., and, still more, ability to appreciate such proof, are a totally different thing. Men do not as yet seem to have been able to devise a system of proving whether certain things are true or are not true, a system as reliable, shall we say, as is a pair of scales for ascertaining weights of objects. And yet, amongst all the phenomena of life are many things, of supreme importance, upon which man must form an opinion, if he is to live as a rational being, and direct his life truly. He cannot afford to wait until clear, unequivocal, proof is forthcoming. To do so is to incur the risk of rejecting, merely on account of insufficient proof, information which, if true, may be of immeasurable importance and value to him. Only one attitude seems reasonable and just. We must, as just said, make up our minds one way or the other, even when proof is not forthcoming. When intellectual proof happens to be deficient, it is often as ( Page 3330 ) stupid to disbelieve, as to believe. There is a superstition of disbelief, as there is a superstition of belief : and it is doubtful from which form of superstition the human race at the present time suffers most. Proof today, perhaps always, is an individual matter for each man. There is a theory, and it is a theory by no means unsupported by evidence and by experience, that it is possible for a man to so train himself that, when a true fact is presented to him for the first time, something within him leaps to greet it, and he knows it is true. We may call this intuition, or anything else we choose : it has many names : but it is a phenomenon open to any one to observe, and to test for himself as a true phenomenon. As Annie Besant has said: "As the higher sense in you which knows truth at sight gradually unfolds, you will be able to take in more and more of the truth. Then there grow up in you a deep inner conviction, and when a truth is presented to you, you will know it is true. This sense corresponds to eyesight on the physical plane. It is the faculty of buddhi, pure reason". [Talks on the Path of Occultism, p.210]. So, the wise man observes instances of this phenomenon in himself, and in others, and, recognising its tremendous and far-reaching importance, deliberately sets to work to train and perfect the faculty in himself. Obviously it can become of incalculable value to him, more particularly in his psychological and spiritual life. Strange and extraordinary, perhaps even impossible, as many of the statements made in these four books may seem, to some readers, it would surely be a wiser policy [seeing that they are all made by sincere and honest investigators,] not to reject them, merely because they cannot be proved, but if they do not awaken a responsive thrill that feels them to be true, to set them aside for the time being, to "file" them for "future reference". Whereas, if they do awaken that responsive thrill, which, in those who have developed the faculty referred to above, is often quite unmistakable, ( Page 331 ) they may be accepted, tentatively at least for the time, as probably true. More and more students of occultism are finding that, as time goes on and they develop their own inner powers, they are able to verify for themselves many statements which, years or months previously, they had accepted in this manner, on the authority of others. So much for the abstruse and complicated question of proof of the teachings of the Ancient Wisdom, in its guise of modern Theosophy. Turning to the ethical aspect of what has been said in these four books, the reader will no doubt have observed that moral and ethical considerations, arising from a study of the occult constitution of man, have been touched upon only occasionally, and quite secondarily. This has been done deliberately, the view having been taken that facts speak for themselves, and point out their own moral. If man is constituted as described, if he has etheric, astral, mental and causal bodies of the nature stated, surely there can be no two opinions as to the way in which he ought, even in his own interest, to live and conduct his relations with other men, and with the world in general. Whether he does so or not is, of course, his own affair entirely. And now a few words directed more specifically to occult students, and to the general method of approach to the subjects dealt with in these four volumes. The Ancient Wisdom can no doubt be presented in many ways, ways utterly diverse from one another. A mechanic would present them in one fashion: an artist in quite another way : a scientist would describe them in a manner very different from that which a poet or a mystic would adopt. According to the types or temperaments of men, and their qualifications and knowledge, so will be their presentations of the eternal verities. Hence, there may be danger for one in the method of presentation of another. To be quite specific, the presentation adopted in these books many would say is mechanical, even materialistic. So be it: but, in the nature of things, ( Page..
Dharma means duty, or obligation, and it is your definite and specific obligation to develop the intuition. The means or methods whereby this development is to be brought about, can be by the study of symbols. I would ask you to note that generalities concerning the intuition, and attempts to define it are very common, but that a real appreciation of it is rare. We are told by physicians and scientists that thousands of cells in the human brain are still dormant and, consequently, that the average human being uses only a small part of his equipment. 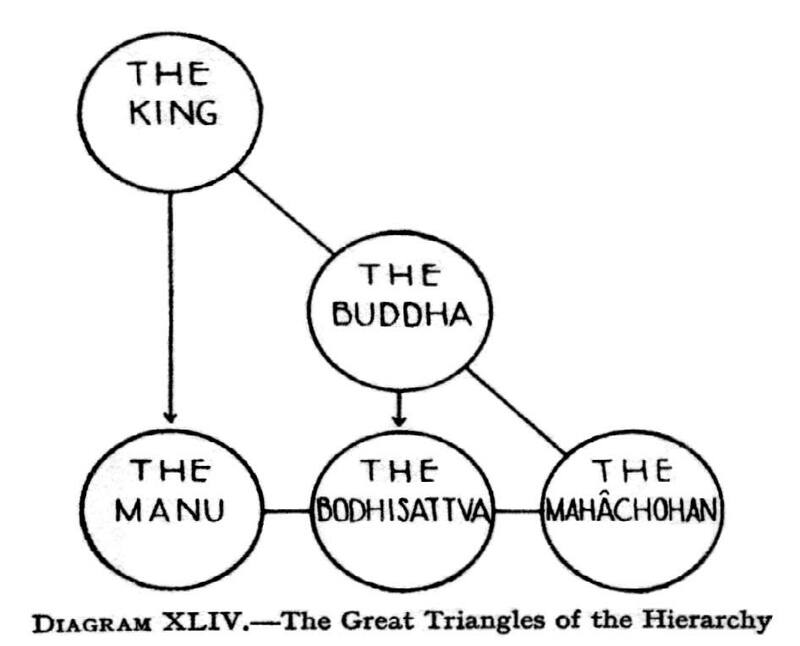 The area of the brain which is found around the pineal gland is that connected with the intuition, and it is these cells which must be roused into activity before there can be any real intuitive perception which, when aroused, will manifest soul control, spiritual illumination, true psychological understanding of one's fellowmen, and a development of the true esoteric sense, which is the objective before you at this time. I. I seek to define for you the intuition. II. I shall deal with its mode of development through the study of symbology. III. I shall close by giving some specific instructions as to a useful mode of procedure. Should you, therefore, find these articles hard to understand and your reaction slow, you must bear in mind that this indicates your need for this study and corroborates what I am telling you. If you will seriously consider with me what the intuition is not, I think my words will find in you an inner response. The intuition is not a welling forth of love to people and, therefore, an understanding of them. Much that is called the intuition is recognition of similarities and the possession of a clear analytical mind. Intelligent people who have lived in the world for some time and who have experienced much and who have contacted many other people can usually sum up with facility the problems and dispositions of others, provided they are interested. This they must not, however, confound with the intuition. The intuition has no relation to psychism, either higher or lower; the seeing of a vision, the hearing of the Voice of the Silence, a pleased reaction to teaching of any kind does not infer the functioning of the intuition. It is not only the seeing of symbols, for that is a special sort of perception and the capacity to tune in on the Universal Mind upon that layer of Its activity which produces the pattern-forms on which all etheric bodies are based. It is not intelligent psychology, and a loving desire to help. That emanates from the interplay of a personality, governed by a strong soul orientation, and the group-conscious soul. Intuition is the synthetic understanding which is the prerogative of the soul and it only becomes possible when the soul, on its own level, is reaching in two directions: towards the Monad, and towards the integrated and, perhaps (even if only temporarily) coordinated and at-oned personality. It is the first indication of a deeply subjective unification which will find its consummation at the third initiation. Intuition is a comprehensive grip of the principle of universality, and when it is functioning there is, momentarily at least, a complete loss of the sense of separateness. At its highest point, it is known as that Universal Love which has no relation to sentiment or to the affectional reaction but is, predominantly, in the nature of an identification with all beings. Then is true compassion known; then does criticism become impossible; then, only, is the divine germ seen as latent in all forms. Intuition is light itself, and when it is functioning, the world is seen as light and the light bodies of all forms become gradually apparent. This brings with it the ability to contact the light centre in all forms, and thus again an essential relationship is established and the sense of superiority and separateness recedes into the background. Illumination. By illumination I do not mean the light in the head. That is incidental and phenomenal, and many truly intuitive people are entirely unaware of this light. The light to which I refer is that which irradiates the Way. It is "the light of the intellect," which really means that which illumines the mind and which can reflect itself in that mental apparatus which is held "steady in the light." This is the "Light of the World," a Reality which is eternally existent, but which can be discovered only when the individual interior light is recognised as such. This is the "Light of the Ages," which shineth ever more until the Day be with us. The intuition is therefore the recognition in oneself, not theoretically but as a fact in one's experience, of one's complete identification with the Universal Mind, of one's constituting a part of the great World Life, and of one's participation in the eternal persisting Existence. Understanding. This must be appreciated in its literal sense as that which "stands under" the totality of forms. It connotes the power of recession or the capacity to withdraw from one's agelong identification with form life. I would like to point out that this withdrawal is comparatively easy for those who have much of the first ray quality in them. The problem is to withdraw in the esoteric sense, but to avoid at the same time the sense of separateness, of isolation and of superiority. It is easy for first ray people to resist the tendency to identify themselves with others. To have true understanding involves an increased ability to love all beings and yet, at the same time, to preserve personality detachment. This detachment can be so easily founded on an inability to love, in a selfish concern for one's own comfort—physical, mental or spiritual, and above all, emotional. First ray people dread emotion and despise it, but sometimes they have to swing into an emotional condition before they can use emotional sensitivity in the right manner. Thiên chức có nghĩa là nhiệm vụ hay nghĩa vụ, chính nghĩa vụ rõ ràng và đặc biệt của bạn là khai mở trực giác. Phương pháp để bạn mở trực giác có thể là bằng cách nghiên cứu các biểu tượng. Tôi muốn nhắc nhở bạn để ý rằng các điểm khái quát liên quan đến trực giác, và các cố gắng để định nghĩa trực giác đều rất dễ làm, còn việc đánh giá đúng về trực giác thì rất khó khăn. Các nhà y học và các nhà khoa học cho chúng ta biết rằng hàng ngàn tế bào trong não bộ con người vẫn còn chưa hoạt động và tất nhiên, kẻ thường nhân chỉ dùng đến một phần nhỏ cái khí cụ của mình. Khu vực não bộ nằm chung quanh tuyến tùng quả là khu vực có liên quan đến trực giác và chính các tế bào này phải được đưa vào hoạt động trước khi có thể có bất cứ nhận thức trực giác thực sự nào mà khi được khơi hoạt, sẽ cho thấy sự kiềm chế của linh hồn, sự giác ngộ tâm linh, hiểu biết đích thực về tâm lý của huynh đệ mình, và phát triển ý thức huyền linh chân chính, đó là mục tiêu trước mắt bạn vào lúc này. I.− Tôi tìm cách định nghĩa trực giác cho bạn. II.− Tôi sẽ bàn cách mở được trực giác nhờ nghiên cứu biểu tượng học. III.− Tôi sẽ chấm dứt bằng cách đưa ra một số chỉ dẫn đặc biệt để tiến hành một cách hữu ích. Do đó, các bạn sẽ thấy là các đề mục này khó hiểu và phản ứng của các bạn chậm chạp thì phải nhớ là điều này cho bạn thấy rằng bạn cần phải nghiên cứu và củng cố thêm những gì mà tôi nói với bạn. Nếu bạn cùng với tôi xem xét một cách nghiêm túc những gì không phải là trực giác, tôi nghĩ rằng các lời của tôi sẽ tạo được đáp ứng nội tâm cho bạn. Trực giác không phải là việc tuôn đổ tình thương cho con người, và do đó, không phải là sự am hiểu về con người. Đa số những gì mà người ta gọi là trực giác chỉ là sự nhận biết về các chỗ tương đồng, và có được một thể trí biết phân tách rõ ràng. Người nào thông minh, đã sống qua nhiều giai đoạn, trải qua nhiều kinh nghiệm, có dịp tiếp xúc với nhiều người khác, thường thường đều có thể thấu hiểu một cách dễ dàng các khó khăn và các khuynh hướng của kẻ khác, miễn là họ chịu khó để ý. Tuy nhiên, những người ấy đừng nên nhầm lẫn điều này với trực giác. Trực giác không có liên quan gì với tâm thông hoặc cao hoặc thấp cả; việc thấy được linh ảnh, nghe được Tiếng Nói Vô Thinh, phản ứng thuận lợi với giáo huấn thuộc bất cứ loại nào đều không có nghĩa là do tác động của trực giác. Không phải chỉ nhìn thấy các biểu tượng, vì đó là một loại nhận thức riêng biệt, và khả năng để điều hợp vào Thiên Trí (Universal Mind) dựa vào từng lớp hoạt động của Thiên Trí đó vốn tạo ra các nguyên hình (pattern−forms) làm nền móng cho mọi thể dĩ thái. Trực giác không phải là môn tâm lý học sáng suốt, và ước vọng để giúp đời bằng tình thương. Trực giác phát xuất từ sự tương tác của phàm ngã, được điều khiển bằng sự định hướng mạnh mẽ của linh hồn và linh hồn có ý thức tập thể. Trực giác là sự hiểu biết tổng hợp vốn là đặc quyền của linh hồn và chỉ có thể có trực giác khi linh hồn, trên cảnh giới riêng của nó, đang tiến đến hai hướng: hướng về Chân Thần và hướng về phàm ngã hội nhập, và có thể (cho dù là chỉ tạm thời) là phàm ngã phối kết và nhất quán. Đó là chỉ dẫn đầu tiên về sự hợp nhất chủ động sâu xa vốn sẽ lên đến tột đỉnh ở lần điểm đạo thứ ba.